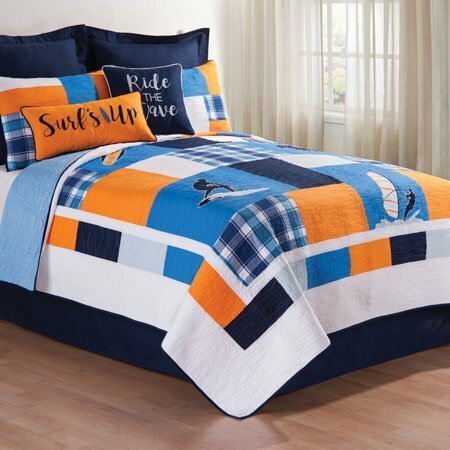 The Surfer's Cove Full Queen Quilt has patchwork blocks of blue, navy, orange, and white with blocks of a blue plaid. Appliqued on some of the blocks are a surfboard, a surfer, a windsurfer, and a woody wagon. The quilt is framed in a band of the color blocks on white, and finished with navy binding trim at the edges. Quilt reverses to solid light blue. 90"W x 92"L. Fits full and queen size mattresses. We offer the complete ensemble in the Surfer's Cove pattern by C & F. Manufacturer's UPC code is 008246333319.